In this chapter are some covers from my collection. They are strictly connected with Italian Social Republic period. Most of them are very scarce. Probably franched with philatelic purposes, the cover above have some GNR (Republican National Guard ) overprinted stamps from Brescia issue. See the scarce special delivery stamp above on the left. The last stamp on the right is the rare "big fasces " of Verona issue. This stamp was placed at the position #100 of the sheet of Verona. These stamps are called " Fascetti" ( see chapter ). The cover has three 30 cent. stamps. Two stamps on the cover above ( 50 cent.-violet and 1,25 Lire-blue ), are from the scarce Florence issue. These stamps are both "Fascetti " ( stamps overprinted with Italian Social Republic symbols ). This cover is a registered and special delivery. Very interesting is the cover above. It was franched with a special delivery stamp of 1,25 Lire with fasces and two splitted stamps to obtain the correct rate. The stamps on cover above is very common, but very scarce if It is isolated on cover. Not easy to find, on cover, the 75 cent. of the second set of Monumenti Distrutti (without watermark ). 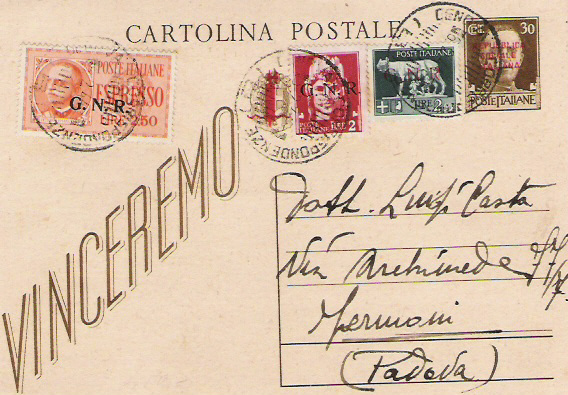 This cover, from Fino Mornasco to Edolo, was mailed on February 13, 1945. Very scarce is the 1,25 Lire stamp on cover, belonging at Monumenti Distrutti set. This stamp is very common but very rare if franched on cover. 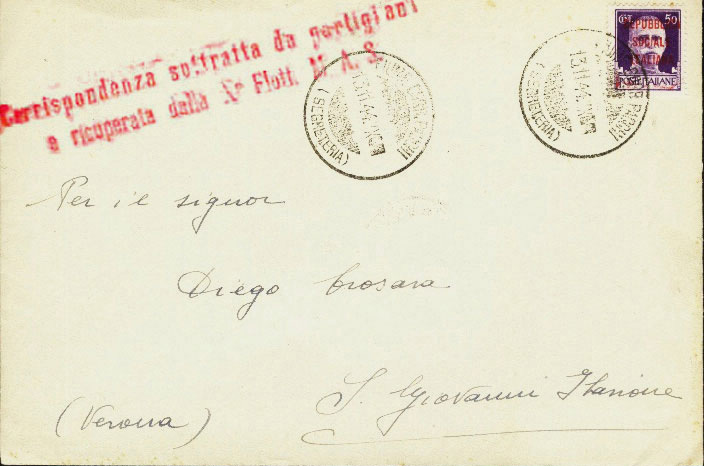 The cover was sent from Motta di Livenza to Salgareda on March 29, 1945. The rarest stamp of the Monumenti Distrutti set on cover. It is the 3 Lire, the last stamp on the right of cover. The cover was sent from Breno to Angolo on April 4, 1945. This stamp, on cover, franched with dates after April 25, 1945, is rare less but very interesting. 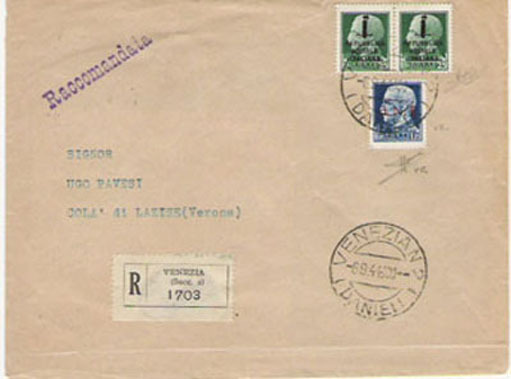 The cover above was sent with the 2,50 Lire special delivery "Fascetto", at the right. This stamp is very rare if franched on cover. This one belong at Genova issue and was placed on the position # 44 of that sheet. Very interesting the cover above. It was franched with six war propaganda stamps. The cover was sent from Bologna to Cuneo on February 7, 1944. The multiple franched covers with 75 cent. Fascetto, are very rare. 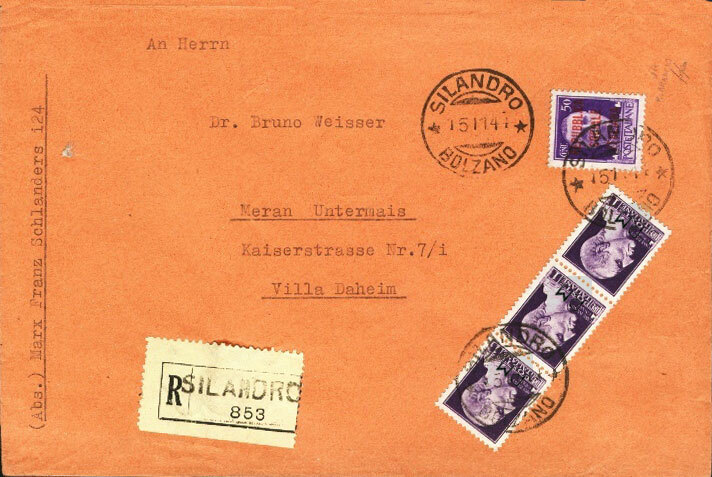 The cover above has six of these stamps and was sent from Bressanone to Bolzano ( Alpenvorland ) on April 13, 1944. Another scarce multiple franched cover. The stamps on cover are the 20 cent. of the first Monumenti distrutti set. There are 25 pieces on cover. A prestigious cover is above showed. It was sent from Posta da Campo ( Fieldpost ) #841 ( see Chapter ) to Locarno (Switzerland ) on April 15, 1945 and franched with the 2,50 Lire special delivery Fascetto. This cover was returned to sender on August 13, 1945 ( the war was ended in Italy ), because the recipient was unknown. Another prestigious cover is showed. It was franched with a 50 cent. fascetto and three 1 Lira stamps with P.M. overprint. These overprinted stamps are very rare on cover during Italian Social Republic period. Some of these stamps were used by German troops deployed in Italy. The cover was sent from Silandro to Villa Daheim on November 15, 1944. The insured cover above, shows two 10 Lire airmail stamps ( on the left ) and a 5 Lire ( on the right ). The 10 Lire airmail stamp is very rare on cover during Italian Social Republic period. This cover was franched with two 75 cent. from Brescia's issue of GNR. These stamps are very rare on cover. This object was sent from Pompiano ( Province of Brescia ) to the same place. An exceptional document is over visible. It is a postcard overprinted by Italian Social Republic symbols with prestige values of the GNR set of Brescia: 2 Lire and 2,55 Lire of the ordinary set and 2,50 Lire of Special delivery set with Metastasio characters. This postcard was sent certainly with philatelic purposes infact It is completely outside rate, however It is an axtremely scarce document. The postcard was sent from Genoa on February 6 1944 and addressed to Padova. The envelope over visible represents a document of remarkable historical-philatelic importance. The partisans, helped from the Yugoslavian leader Tito, laid ambush at mail transports to attempt interrupting every type of communicationsof communication. On the end of the 1944 the Italian Social Republic authorities, deployed some units of the X° Mas in the zone, attempting to contrast partisan sabotages and, in some case, it was possible to restore communications and mail service too. This envelope, sent from Fiume and addressed in the province of Verona on November 13, 1944, shows a red linear overprint who says: Mail emblezzed by partisans and recovered by X° Mas. This sort of overprint on covers, is extremely rare. This cover is a remarkable sample of a multiple franking. This document contents 20 pieces of a 5 cents. stamp overprinted in Brescia. The envelope was sent from Cavriana to Castiglione delle Stiviere on November, 10 1944. This cover is a rarest testimony of air mail forwarding. The air mail service, during Italian Social Republic age, was extremely limited, due the sky control by Allied forces. Extremely rare too is the use of emergency franking stamps, represented by postage due and parcel post stamps. The cenvelope above showed, is extremely fine. It is a registered letter in perfect rate, sent from Venice to Lazise (Verona) on September 6, 1944. the stamps on this cover are a 25 cents. from Fascetti set and the 1,25 Lire with GNR Verona overprint. The use of this last stamp represents a rarity, if It is on cover. A rare document is visible on the picture over. 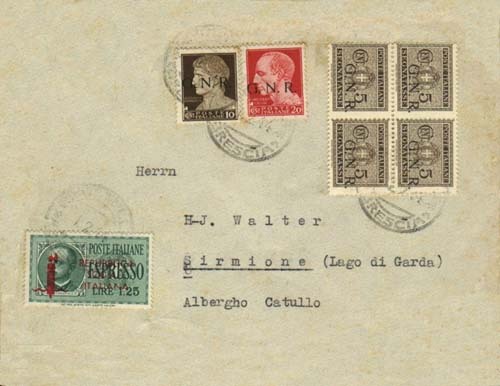 This envelope, dated March 1945, was sent from Milan to Parma and was franked by two 50c. stamps: one of these is belonging to Destroyed Monuments set, and the other is a 50 cents. with P.M overprint. The post office did not consider valid this last stamp and the cover was taxed. 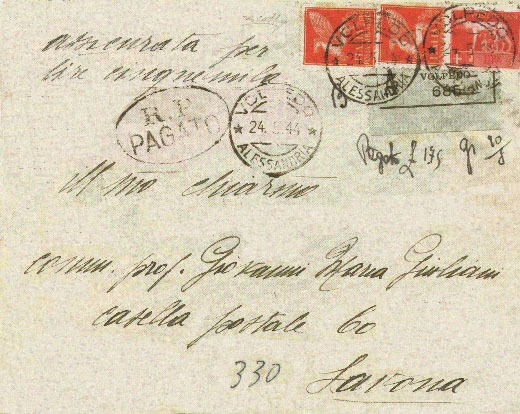 The covers franked with P.M. overprinted stamps are extremely rare during Italian Social Republic age, but this cover is, maybe, the only one document known with tax stamp applied on. This precious cover is an exceptional document. This one was franked by: 1,25 lire Special delivery and 75 cents. (Fascetto ), both of Turin issue ( 75 cents. has strongly shifted perforation too ), a couple of GNR Brescia overprint War Propaganda stamps and, dulcis in fundo, an air mail stamp with P.M. overprint. Although the rate is in excess of 1,25 Lire, this envelope is decidedly the most valuable piece and has an exceptional importance. This cover was sent, on June 24, 1944 from Bordighera to Ventimiglia. This precious registered letter with multiple franking, is composed from values decidedly not common to find on postal documents . We can see a couple of 5 cent -postal due- with fasces overprint, a 50 cent. of tha same set, a 25 cent. parcel post ( very scarce on cover )and a 50 cent. Postage revenue described in the chapter " Private Overprints". Very interesting and rare is the envelope over visible. Above the cover there are a lot of GNR stamps overprinted in Brescia ( 20 cent., 10 cent., and 4 valuable 5 cent.-postage due- ). 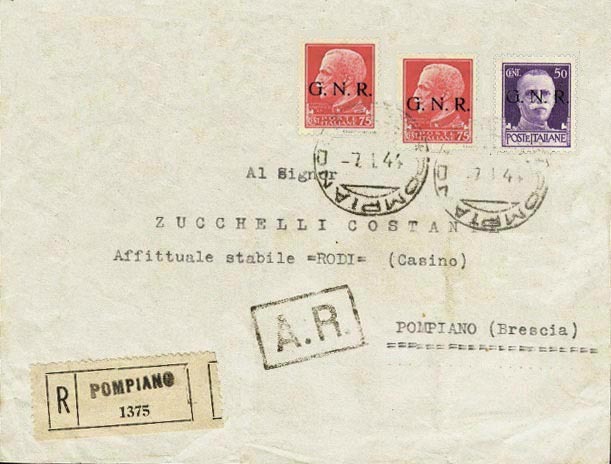 The cover was sent from Brescia to Sirmione, at the Hotel Catullo on the February 1, 1944.